The cabinet reshuffle continued for the second day yesterday with eight new state ministers and ten new deputy ministers being sworn in. The state and deputy ministers were sworn in by the President at the Presidential Secretariat at 10.30 am yesterday. The Fisheries and Aquatic Resources Development and Rural Economy Ministry had both a Deputy Minister and State Minister appointed to it with the State Minister post being retained by Dilip Wedaarachchi and the Deputy position being given to Ameer Ali Shihabdeen. Seyed Ali Zahir Moulana was sworn in as National Integration, Reconciliation and Official Languages Deputy Minister. Manusha Nanayakkara who was earlier Foreign Employment Deputy Minister has been given Telecommunication and Digital Infrastructure added to his responsibilities. Palitha Kumara Thewarapperuma was sworn in as the Sustainable Development, Wildlife and Regional Development Deputy Minister and his previous post as Internal Affairs and Wayamba Development Deputy Minister has been given to Muthu Sivalingam. The newly created Science, Technology, Research, Skills Development and Vocational Training and Hill Country Heritage Ministry will have both a State and Deputy Minister under it. State being given to Lakshman Seneviratne and the Deputy post given to Karunarathna Paranawithana. Paranawithana was previously Local Government and Provincial Councils Deputy Minister. 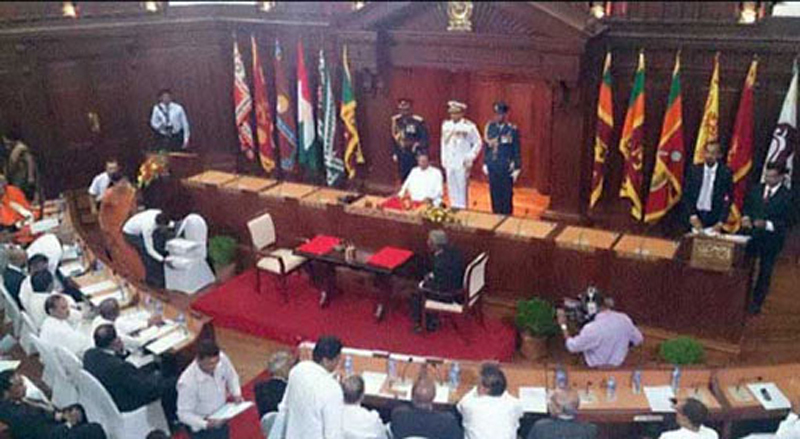 In his place, Sriyani Wijewickrama has been sworn in as Sports, Provincial Councils and Local Government State Minister. Dunesh Gankanda previously Disaster Management Deputy Minister is now Lands and Parliamentary Reforms Deputy Minister. Gankanda’s post will be taken over by Palitha Range Bandara as the Irrigation and Water Resources Management and Disaster Management State Minister. Weerakumara Dissanayake, a new entrant to the government from the SLFP has been appointed as Mahaweli Development State Minister functioning under the President and previously held by Minister Mahinda Amaraweera. A.D. Champika Premadasa who was Industry and Commerce State Minister was appointed as Plantation Industries State Minister. Former Prison Reforms, Resettlement and Rehabilitation State Minister M.L.A.M. Hizbullah has been appointed as the Highways and Road Development State Minister. H. M. M. Harees who was the former Sports Deputy Minister will now be Public Enterprise and Kandy Development Deputy Minister. Sarathie Dushmantha Mithrapala is the new Justice and Prison Reforms Deputy Minister while Ranjan Ramanayake is Social Empowerment Deputy Minister. Mohan Lal Grero is the new Higher Education and Cultural Affairs State Minister.